Midwife Hazel Inglis with two mums. Mums-to-be in the Highlands are being invited to take part in a documentary to showcase the work of community midwifes in the north. ‘The Highland Midwife’ series, which was shown on Channel 5 last year, is currently filming its second series across the north and Argyll and Bute. The documentary is scheduled to return again, with the production team eager to get more soon-to-be parents on the big screen. 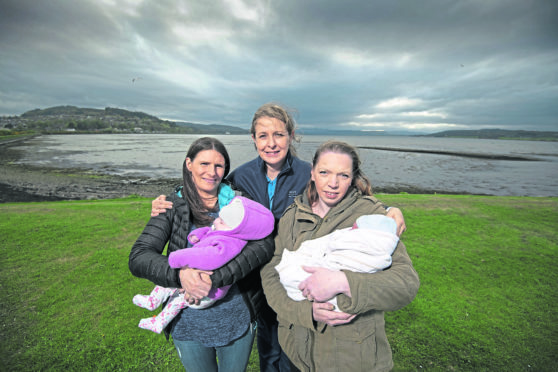 Suzanne Fee, 25, from Campbeltown, took part in season one of the serious and expressed that any mums-to-be should seriously consider taking part. She said: “The crew were amazing and came to our house beforehand for dinner so we could get to know them. When it came to filming I didn’t feel like there was a camerawoman standing in the room, because I knew her so it felt quite normal. She’d also seen it all before. “There’s nothing to be scared of, you can have the birth filmed, but still retain your modesty. Throughout the whole thing you are asked if you’re ok and they do all they can to keep you relaxed. You also get to see the footage before it goes out and that footage is yours to keep. Jaki Lambert, lead midwife for Argyll and Bute, is pleased with how the first series showcased the work done across Highland by community midwives. She said: “The three programmes showed great examples of high quality midwifery care across Highland and showed our staff doing amazing work in looking after mums and their babies. Anyone interested in taking part should contact series Amanda McGlynn on 0141 332 0319 or by email Amanda.mcglynn@matchlight.co.uk.